You know the stuff... pink wrapping... chocolate & toffee rolled in almonds... Almond Roca? It's just about my favorite thing in the whole world. Dangerous stuff that roca is. I can't have it in my house for fear of a major gorge-fest. 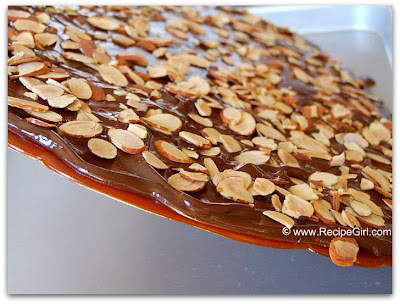 I tempted danger though and made my own homemade Chocolate- Almond Toffee. Surely I could tuck it away in the freezer and resist temptation, right? The recipe isn't really complicated. 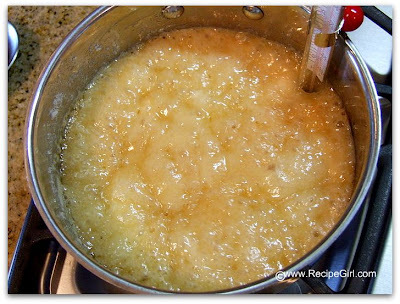 Sugar, butter and corn syrup bubble away until turning caramel-colored. You must have a candy thermometer though to get the toffee part just right. Too cool and it won't set correctly. Too hot and you'll have burnt toffee. 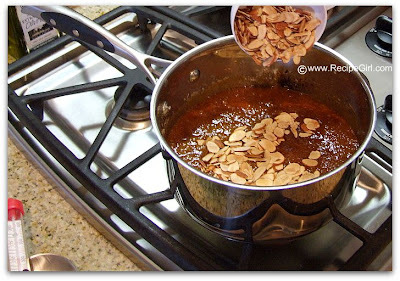 When ready, the mixture is pulled from the heat and mixed with a handful toasted almonds. 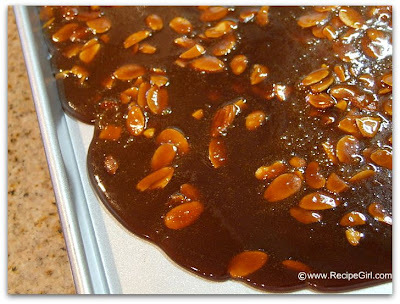 The toffee is then poured onto a cookie sheet and quickly spread out. It will begin to set almost immediately. 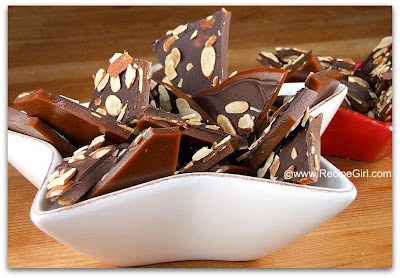 A short visit to the refrigerator will ensure that the toffee with harden enough for the next step. Melted chocolate is spread upon the chilled toffee. 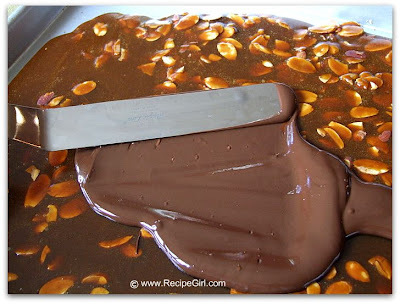 Toasted almonds are sprinkled on top of the chocolate and lightly pressed down to stick. Once hardened, the entire 'sheet' of toffee can be easily lifted off of the cookie sheet and broken apart into smaller pieces. Ready for consumption... or packaging... or giving away... or freezing! I'm happy to say that my batch is safely stowed away in the depths of my freezer- awaiting the time that I put together my holiday goodie trays. Visit RecipeGirl.com for over 50 Holiday Cookie Favorites HERE.